Some people say one should not look behind. The past is gone, and you cannot change it anymore. Well, that’s true and it is indeed the right attitude to look into the future because this is the only place where you can change things and introduce innovation. However, I am on the opinion that it is important to consider what has happened in the past. It is significant to understand why things happened and to learn from it, in order to avoid and overcome mistakes from others and thus make things better in the future. As a technology analyst, I am frequently in touch with CEOs, CIOs and other decisions makers from organizations of any size. During advisory sessions and workshops, digitization is the hot topic to discuss for the last 5+ years. However, after a short period of time, the majority of decision makers start defending themselves, claiming their organization is already digital for quite some time. They are digital by providing their employees with software applications, desktop computers, smartphones, tablet computers or running networks of servers and so on. Well, on the one hand they are right. On the other hand, they express that they did not understand what digitization really means today. And thus, why companies like Amazon, Google, Alibaba and so on are out of their sight and far ahead of the competition. However, the success of Google, Amazon, etc., are no overnight success stories but took at least 10 years or even longer. And this is why it is so important to consider what has happened in the past. Hint: Amazon was only a web shop some years ago. Now, it has multiple business units and is still growing by experiments and just tries if something potentially works. Considering that in my opinion the term “digital transformation” is misleading. It is a digital evolution; every organization worldwide is faced with for already a long time. Based on my ongoing experiences above, I decided to write this piece to unveil the broken mindset of the old economy, by getting a wrong understanding of digitization and underestimating the impact of information technology (IT) and digital technologies for the business. All in all, digitization is nothing new and has changed its face over the last decades. Digitization today is completely different from digitization in the 1980s or the 1950s when the first microprocessor hit the market. However, the digital evolution has every organization over a barrel. And each company needs the necessary fundamentals in order to adapt this ongoing progress and achieve change inside the entire organization. “Digitization is changing everything.” This is a statement you might have heard sufficiently the last months and years. A statement that is absolutely wrong. It reflects a false attitude and misunderstanding of the market and its people who claim this statement. It is wrong because digitization already has changed everything! Exactly this perception of digitization leads to the misconception by comparing digitization with the popular used but misleading term “digital transformation”. However, it might be because over the last three decades, IT departments worldwide have developed, introduced, updated and detached vast quantities of IT systems. They have digitized their organizations by introducing all kinds of IT solutions, like ERP and CRM systems, office solutions or self-developed applications. The IT department was the maintenance crew of the digital engine room, no colleague wanted to deal with respectively was able to deal with. Thus, IT solutions have simply been used by many people but obviously not considered as digital technologies. Today, everything is believed to be completely different. Due to “consumerization of IT” and the easy access to IT resources, everyone is able to use e.g. an iPhone or get access to any kind of application via software as a service (SaaS). Hence, thanks to “consumerization of IT” digital technologies became more and more ubiquitous and came onto the radar of people who normally only have been in touch with digital technologies at work. Eventually, digital systems have been introduced and maintained over the last 30 years. Indeed, the term “digital transformation” is a little bit confusing, especially if someone is working in IT for decades and has seen all of its developments. The term digital transformation is misleading because digitization is a continuous development process and must be considered as a progress. It is digital evolution! Digitization is hassling leadership teams by letting them challenge the existing business model and reinvent oneself to confront the competition with a digitized organization. 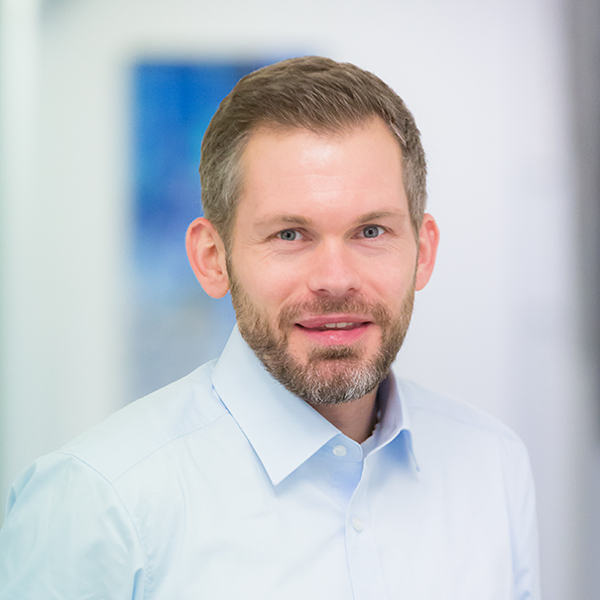 Apart from that the leadership’s task is to develop a unique digital agenda they can leverage to highly interconnect with customers, partners and suppliers and therefore redefine all necessary processes, understanding them as an essential part of a digital enterprise. In doing so, it is important to put the customer tenaciously into focus of interest. Based on smart products and AI technologies, organizations are able to get a better understanding of their target groups and to spot the current needs and thus act proactively. These include the development of “data driven apps” to raise as much qualitative data as possible and to use it at the scene of event (digital touchpoint) in order to increase the digital user experience for customers as well as partners and suppliers. However, talking digitization means talking about a digital evolution and not a transformation. We are within a digitization process that has started around 50 years ago when Intel introduced its “Intel 4004” processor in series and SAP, Microsoft or Apple were founded. In the meantime, you can find PCs or Macs in every office and the use of mobile devices is continuously growing. However, even after these 50 years not every process has been digitized so far and doing things for the sake of doing things is simply wrong. On a final note, Netflix is one of the prime examples of the digital evolution. Netflix was founded in 1997 as a DVD shipping company (using the Internet) exclusively for US customers. But shortly after Amazon introduced its cloud business Amazon Web Services (Amazon EC2 in 2006), Netflix launched its streaming service in 2007 and thus changed its business model. This transition was a major evolutionary step. First of all, Netflix not only understood the growing power of the Internet and thus to reach a much bigger customer base by serving a global audience. But most importantly, Netflix saw the technological potential of the cloud to execute this huge business opportunity. Evolution means to be able to adapt to ever-changing living conditions. It’s about mutability. Or in other words: eat or be eaten. This is exactly what the nature is showing us. Netflix has changed because the environment around the company has started to change. For example, many companies have only used the Internet e.g. for hosting a website (using it to market their existing products). But no one from the pre-Internet era used the Internet early to develop new things by using the Internet. Only a few respectively only new companies like Google, Amazon, Spotify or Netflix saw the potential of the Internet and developed the Internet further by introducing new ideas, offerings and services. Netflix is a good example showing that evolution always wins. But this includes to change the own mindset. The digital enterprise has quite a long history. As a matter of fact, everything started in the 1950s – around 70 years ago. 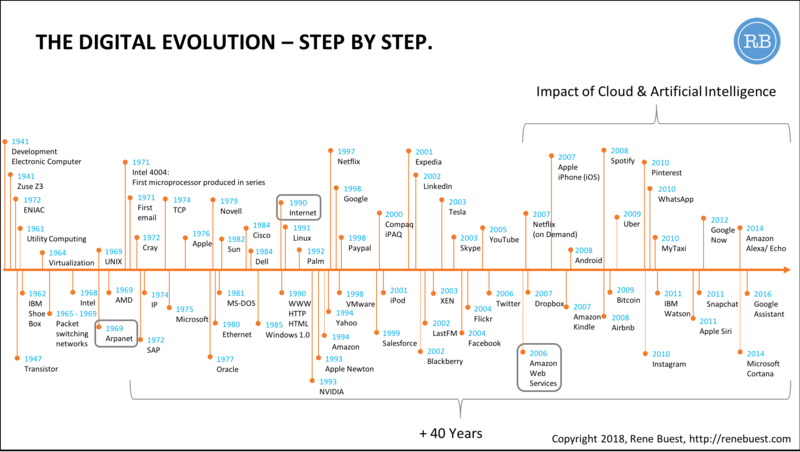 To get a better understanding of the digital enterprise evolution it’s easier to cluster this progress into four phases, starting in 1950. The decades from 1950 until 1969 can be described as Pre-Digital Enterprise era. These were the years of all the necessary groundwork and fundamental research and development for building the digital enterprise. In the course of this epoch the first high-level programming languages like FORTRAN, COBOL, BASIC and the compiler-compiler have been developed. The UNIVAC hit the market, which was the first commercially successful electronic computer and is regarded as the first general purpose computer. The introduction of the UNIVAC marked the ultimate beginning of the computer era. Terminal systems that were organizations-wide connected to a central computing system (mainframe) are introduced that used a timesharing concept to get equal access to computing power. The development of the UNIX operating system started, which was the foundation for Linux that powers 36.9 percent of today’s websites worldwide (as of October 23, 2017). However, one of the key milestones of this epoch was the development of ARPANET, which is the fundamental basis for what today shapes the Internet. The years between 1970 until 2000 shaped Digital Enterprise 1.0. This epoch signifies the introduction of information technology (IT) into the organization across all departments. And thus, giving employees access to IT providing them with personal computer (PC), other hardware like printers and software applications. In the course of this decades, Intel started producing its first microprocessor “Intel 4004” in series and today’s IT giants like SAP, Microsoft or Apple have been founded. The programming language C was developed, and Texas Instruments released the first portable electronic calculator. The programming language Prolog introduced a paradigm shift of logical programming, which is used for developing expert systems and artificial intelligence (AI) solutions. The development of Ethernet (1980) was another major milestone, which became the common standard of connecting PCs and other hardware devices such as printers, let them interact and share data. As a matter of fact, organizations started connecting group of machines like PCs, servers etc. and thus created local area networks (LAN) and after that connecting domestic and international branch offices using wide area networks (WAN). LANs, WANs and the development of the TCP/IP protocol suite were the foundation for client-server architecture. In a client-server model, one or more central computers (servers) are acting as a resource provider e.g. a data storage device (like file server, database server) and providing client computer with software applications (e.g. application server) and other services. Client-server computing itself was the basis for the so-called enterprise computing – the professional usage of IT inside organizations rather than private users. The most important milestone of this epoch, however, was the invention of the World Wide Web (WWW) to make documents and information accessible worldwide and across different types of computer systems. The integration of several developments such as ARPANET, TCP/IP, client-server model, networking, telecommunications, hypertext, WWW and more formed the Internet. However, the majority of companies have only used the Internet e.g. for hosting a website and to market their existing products and content, but actually no one from the pre-Internet era developed new things and services using the Internet and thus didn’t help to put progress into the development of the Internet. In 2016, the estimated total number of Internet users was 3.431 billion (47 percent of world population (7.3 billion people)). In fact, the Internet was the driving force behind the fundamental development of search engines (e.g. Google) and helped shaping the e-commerce business (e.g. Amazon and Alibaba) as well as led to several new digital-ish business models. As a consequence, the Internet is considered as the foundational success story of the so-called platform companies (aka platform economy). 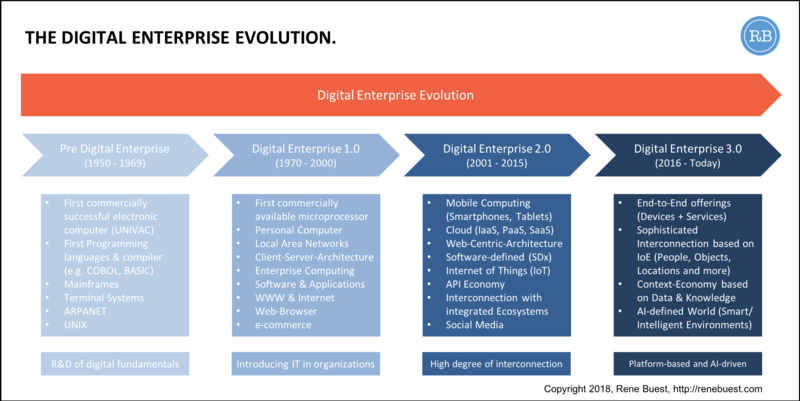 Between 2001 and 2015 the years of Digital Enterprise 2.0 arose. This was the time when the famous buzzword digital transformation hit the media landscape and the majority of organizations worldwide finally realized that IT was more than just a supporting tool but to understand it as a central part of their business strategy. However, the significant characteristics of this epoch was the high-degree of interconnection between organizations and their customers, partners and suppliers, creating integrated ecosystems – and this systematically supported by IT solutions. By doing this, organizations started making use of technologies e.g. like mobile computing, cloud computing, web-centric architectures, software-defined environments, Internet of Things (IoT), social media and API economy and thus ensuring a better interconnection within inside as well as outside the company, across different industries and beyond borders. Needless to say, the fast development of the IT industry helped a lot of companies, in particular, startups and digital natives building businesses upon digital disciplines. In the process, mobile computing (like RIMs BlackBerry, Apple’s iPhone and iPad, Google’s Android) served customers with information, apps and services at the scene of the event by creating a digital touchpoint without being limited of a certain place but create a mobile user experience on the go. 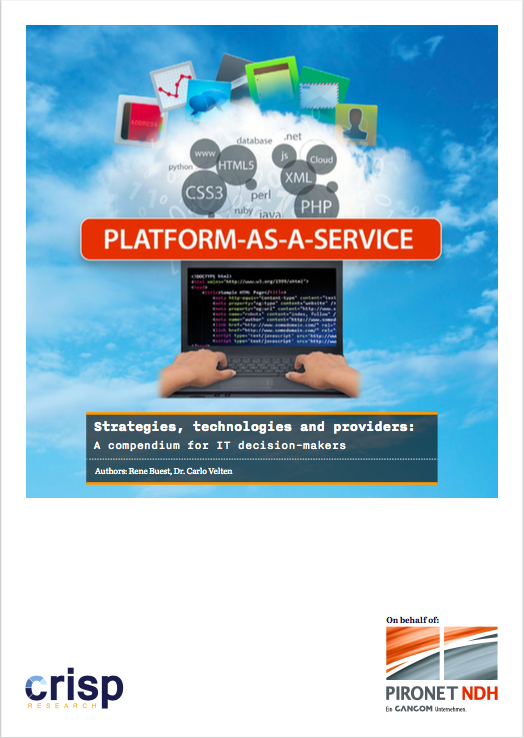 Web-centric architectures based on software-defined environments and cloud computing supported this movement, by shifting infrastructure (IaaS), platform (PaaS) and software (SaaS) to a central place that can be accessed with an ordinary data connection via an as a service approach. In particular, the cloud helped startups avoiding heavily upfront investments in IT resources but purchase the needed resources on an on-demand base. Thanks to Amazon respectively its cloud computing subsidiary Amazon Web Services (AWS), startups like Pinterest, Spotify or Airbnb were able to gain quick success utilizing public cloud services and wouldn’t exist without it. However, the cloud helped organizations of any size getting quick access to state of the art technologies and innovative services, reach a global audience, operate scalable IT environments, but also shift their IT spending’s from capex to opex model. As part of digital strategies, the cloud became more and more important. 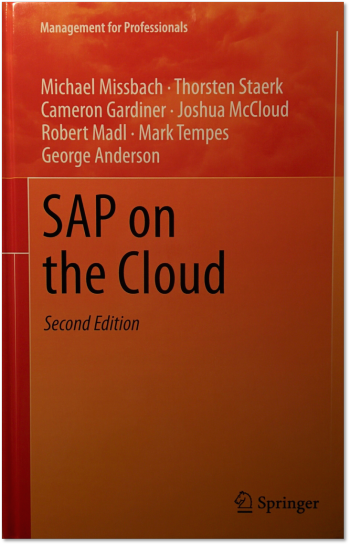 It served as the ideal foundation for a straightforward access to IT resources and empowered every organization to act in an agile way. As a technological foundation, it served as a means to an end and enabled the access to ongoing innovation such as AI-related services. Along with the mobile and cloud movements, the Internet of Things (IoT) became more and more popular and arose as one of the driving mega-trends of Digital Enterprise 2.0. 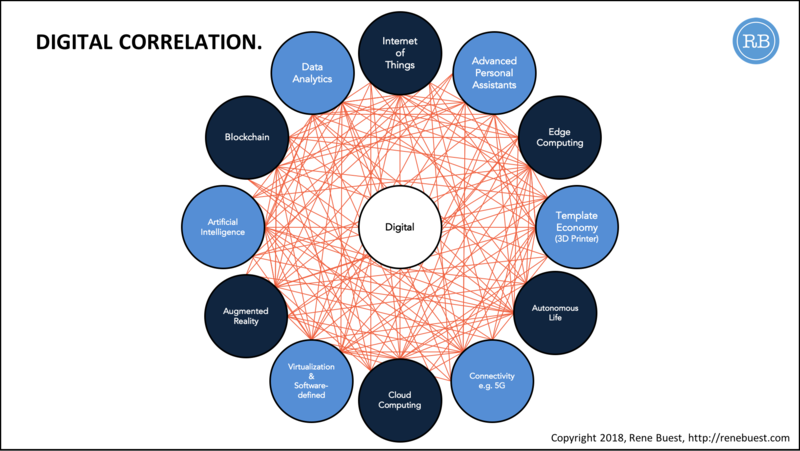 The IoT connects the digital with the analog world by seeking for a maximum interconnection and the highest possible information exchange. It describes the linkage of physical objects such as cars, industrial facilities, household items and many other sensors, as well as humans with digital services via a data connection. The IoT dismantles existing data silos, enables access to novel data sources and hence opens organizations entirely new business opportunities. Thanks to cloud computing, mobile solutions, wireless connections and big data analytics, the (technical) efforts and (investment) costs for necessary IT solutions dropped significantly. There is also the fact that the costs for sensors and devices are getting cheaper, which makes it more reasonable to collect and analyze data of any device at any time and location. Improvement of marketing activities by a more intense monitoring of people’s behavior, of things and data based on the analysis of the time and location where objects are located and act. These include e.g. location-based advertisement and the analysis of buying behavior across a variety of stores (businesses). Enhancement of reactions to certain situations in real-time. This includes e.g. the control of transport routes based on distinct variables like weather, gas consumptions or soft factors like possible perils. Support of decision-making by sensor-based analytics based on profound analysis like the perpetual monitoring of patients for a better treatment. Higher automation rates and better control for the optimization of processes and a better resource utilization (e.g. smart metering) as well as for risk management systems. During this epoch, the collection and analysis of data proliferated. Depending on the organization, this was from plain harvesting of data up to utilize data for business process optimization, evaluate new business opportunities or develop new business models. With the soaring amount, variation and velocity the data arrived, traditional infrastructure quickly reached their maximum scalability. All applications, which evolutional behavior was strictly encapsulated befell the same destiny since these were not able to dynamically keep pace with the rising requirements of the business. In order to meet the increasing challenges of IoT workloads and growing sensor and meta data new agile platforms and massive scalable infrastructure were necessary. Standardized toolkits and interfaces helped with the quick introduction of powerful IoT workloads and ensured a stable communication between applications, services, sensors, platforms, dashboards as well as the collection, analysis and preparation of data. Another mega trend that reflects the impact of a high degree of interconnection for Digital Enterprise 2.0 is social media. The fundamental idea of social media is to bring people together via Internet-based services. Thus, when people used those Internet-based applications, they interacted with highly dynamic platforms such as blogs, microblogs, forums, social networks, business networks, video/ photo sharing and gaming sites. Using social media services through a web-browser via their desktop PCs and laptops or via native mobile applications on their smartphone and tables, they participate in a world of user-generated content by writing posts or comments, sharing photos, videos or simply share their thoughts or what they are doing at a very moment. Based on their interests and behavior social media sites connected user profiles with other individuals or groups and thus creates a social network. Social media differs from traditional media like magazines, newspapers or TV in lots of ways. This includes quality, usability, reach, frequency and interactivity. Social media operates in a highly dialogic system, where many sources are connected to many receivers. These characteristics, however, had a substantial impact of the communication between organizations, their customers, communities and other individuals. Understanding and thus doing social media the right way, it can help to improve the connection with customers and groups of individuals and can be a powerful communication and marketing tool for businesses and organizations. With that said, social media services enable organizations to reach a broader, even global audience and engage with them in a direct and much closer way by understanding and analyzing their ways of thinking and acting and hence enhance the customer experience. On the one hand, engaging with social media services, people get more power by praising or complaining in public to a much broader audience about a brand, product or service. However, on the other hand, individuals are becoming more transparent to the social media platforms and organizations that target these individuals, by sharing more and more personal information and behavioral pattern. Some of the most popular social media sites are Facebook, Instagram, LinkedIn, Pinterest, Reddit, Snapchat, Tumblr, Twitter, WeChat, Weibo, WhatsApp, Wikipedia and YouTube. As of November 2017, the biggest social media sites together have more than 100,000,000 registered users. Social media plays an important role as part of the high degree of interconnection era for organizations to engage and interact with e.g. customers in a much deeper way. In Enterprise 1.0, enterprise application integration (EAI) was the central anchor as part of client server communication to ensure business process integration within the whole value chain. The focus was on the tight interaction of a variety of applications that are distributed over several independent operated systems. The goal: the uniform and integrated mapping of all business processes in IT applications and thus to avoid data silos. However, the transition into the cloud age lead to a change in the usage behavior of on premise interfaces to a mainly consumption of web APIs. Eventually, each cloud and web services provider offer a REST or SOAP based API that enables to integrate services in the own application and thus benefit directly from external functionality. Along with the increasing consumption of cloud services and the ever-growing momentum of the Internet of Things, the importance of APIs rose significantly. Another important trend of Digital Enterprise 2.0 was the API economy. The API economy describes the increasing economic impact of APIs. Digital natives such as Google, Amazon or Facebook used the API economy and monetized their services by offering APIs to give external users access to their services. Openness is an important part of the API economy. Google understood this from the very beginning by position itself as an open platform. Important to know, openness in the context of providing access to its own services via APIs. In his book „What Would Google Do?“ Jeff Jarvis illustrates how Google – based on its platform – enables other companies to build own business models. Not without a cause – of course. This kind of openness and the right use of the API economy quickly lead to dissemination and made Google to a cash cow – e.g. via advertising. The API economy quickly lead to an increasing number of Mashups. In IT, a mashup describes a web application, which uses services from more than one source to build a complete new application or service. For example, Uber has integrated Google Maps into its mobile application to order a ride and set the pick-up location. Another example is Netflix that leverages Amazon Web Services (AWS) cloud services portfolio to develop and run its video streaming service on top of AWS. Electronic commerce company Zalando used the API economy externally as well as internally. Zalando builds and operates big parts of its infrastructure on top of AWS. In doing so, Zalando designed the entire environment based on a loose-coupled micro services architecture. Each micro service is developed and maintained by a single team of developers that operates its own virtual datacenter. As of 2016, Zalando runs over 60 virtual data centers. All micro services, that together assemble the e-commerce website, access each other via their public APIs. The cloud native Internet companies reflect this trend. APIs are still a central competitive factor for players like Salesforce, Twitter, Google, Amazon and Amazon Web Services and represent the lifeline of their success. All providers have created an own API ecosystem around them, which is used by their customers and partners to develop own offerings. Selling premium functions inside a free of cost service. Charging the sharing of content through an application or service of a partner. CIOs benefit from the API economy by getting access to a quasi-endless choice of applications and services they can use to expand their websites, applications and systems without developing, operating or even maintaining these functionalities on their own. Furthermore, APIs enable partner, customers and communities to get an easy access to own applications, data and systems to let the CIO’s company become a part of the API economy. Everything works using pretended simple API calls. However, the devil is in the details. Integration and API management have a big significance in the API economy. However, the vast majority of organizations worldwide are still a Digital Enterprise 2.0, trying to challenge their existing business model and reinvent oneself to confront the competition with a digitized organization. 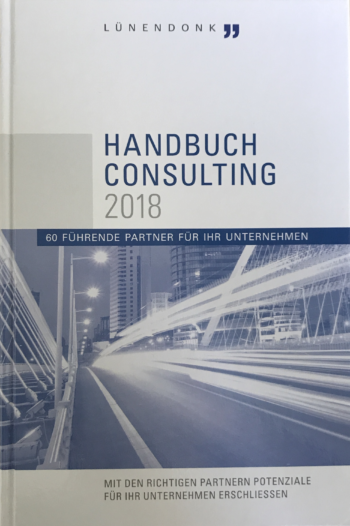 Apart from that the leadership’s task was to develop a unique digital agenda they can leverage to highly interconnect with customers, partners and suppliers and therefore redefine all necessary processes, understanding them as an essential part of a digital enterprise. In doing so, it is important to put the customer tenaciously into focus of interest. Based on smart products and artificial intelligence technologies, organizations are able to get a better understanding of their target groups and to spot the current needs and thus act proactively. This includes the development of data driven apps to raise as much qualitative data as possible and use it at the digital touchpoint in order to increase the digital user experience for customers as well as partners and suppliers. The fact of the matter is that the entire supply chain needs to become much more agile to be ahead of competition. This is about real-time! In the best case, organizations know already one hour or even earlier what a customer is going to need. In other words: predictive analytics is becoming continuously more important. It is necessary to decrease set-up times for machines, to interconnect the entire supply chain and to scale with the help of the cloud. Because one simple fact reflects this epoch of digitization: markets are not predictable and thus the set-up times had to become faster. Another prime example is Vorwerk’s Thermomix. Originally introduced in 1971 the kitchen appliance was continuously advanced over the last over 40 years until 2014 when the latest version TM5 hit the market. One of the important things of this model is that it incorporates digital technologies, as it allows for “guided cooking” using proprietary memory chips to provide settings and cooking instructions and has replaced all the buttons and knobs in previous models with a touch screen. Furthermore, a mobile application allows to plan for the week (month) and communicates with the Thermomix. A new Wi-Fi module replaced the memory chips and lets the Thermomix connect to the cooking experience website Cookidoo where the Thermomix gets access to the recipes. Bottom line, Vorwerk was able to advance and even digitize a product that is over 40 years old and thus understood to align its product as part of the digital evolution. Along with end-to-end offerings, a sophisticated interconnection based on Internet of Everything (IoE) is imperative for this epoch. Here, a very dense interconnection across people, devices, objects and locations helps to provide customers with tailor-made solutions and services at the scene of event respectively the hybrid touchpoint and thus connects the digital with the analog world even stronger. For example, even if location-based services are a trend from Digital Enterprise 2.0 that has been discussed for quite a long time. However, it actually hasn’t being used e.g. by local retailers to engage with their customers. With the ever-growing use of smartphones and other mobile devices, our digital society reached a point where we are actually not able to not provide data anymore. And even if we do not tweet, search or do other things actively online, we – or better our devices – are constantly sending data. Like locations or other data from us. For a digitized organization this means that based on mobile technologies as well as data, information, knowledge and opinions it is becoming much easier to get in touch with a group of target customers and thus enhance the customer engagement. As a Digital Enterprise 3.0, organizations also participate in an AI-defined world where intelligent or smart environments make our everyday life more efficient and convenient. If you look at AI from a different angle. Consider our life as a process. Consider every day as a process that is divided into single steps. And then, consider AI as autonomous process automation that provides us with more convenience and thus makes our life easier. Imagine a virtual private assistant like Amazon Alexa or Apple Siri as personal watchdog in business. Checking your phone calls, autonomously negotiating appointments with e.g. colleagues. I am talking about a very early version of Iron Man’s AI “Jarvis”. Or what about Alexa or Siri as your very personal life assistant. Let’s say you are speaking at a conference. Your flight home leaves at 4PM. In order to reach your flight on time, your personal life assistant autonomously orders you a ride for 2:15PM since your speech ends at 1:45PM and the traffic information looks busy today. The virtual assistant just sends you the details of the pickup location which is right in front of the conference venue. The assistant simply follows the entire process you would usually go through: from taking the phone out of your pocket, opening the app, searching for the target location and then ordering the ride. So, keep your hands and mind free for more important things. Of course, you have to give the AI access to your calendar, geo location and other information. Or imagine an intelligent version of the kitchen aid “Thermomix”. The dish advisor: Based on what the kitchen helper finds in your fridge it makes recommendations what you could possibly cook. And when some ingredients are missing it could ask for permission to order them online. The health advisor: Based on your eating behavior of the last weeks it would nicely recommend you not to cook the tiramisu you were just about to prepare, because this wouldn’t be good for your consumption of calories. However, also organizations need to understand AI as the future of any digital business. Imagine when anything that is a process can and will be run by an AI. Because, with AI anything that is a process in your company can be automated. This is an important fact on your journey to new business models since an AI-operated business empowers you to use your financial resources and talent much more effectively. AI is the next logical step after the cloud and benefits from its success. The cloud is the enabler from a technological perspective. AI is about the business value and thus leads to smarter and more intelligent applications. Based on a sophisticated data analysis, AI applications that run in the background help to refine the customer approach and tailor products even better to the current needs. A better understanding of customers based on past interactions and behaviors. A fancy experience of changing the customer interaction from keyboard entry to speech control. Deeper engagement with smart virtual assistance enhancing the customer experience. Customized products and service offerings aligned with customer needs. Predictive by analyzing data, interactions and behavior from the past and in real-time. Conversational with smart personal assistants and bots. Augmentation of existing and new products, services, applications and processes. However, the potential of AI is not just simply to optimize existing processes. 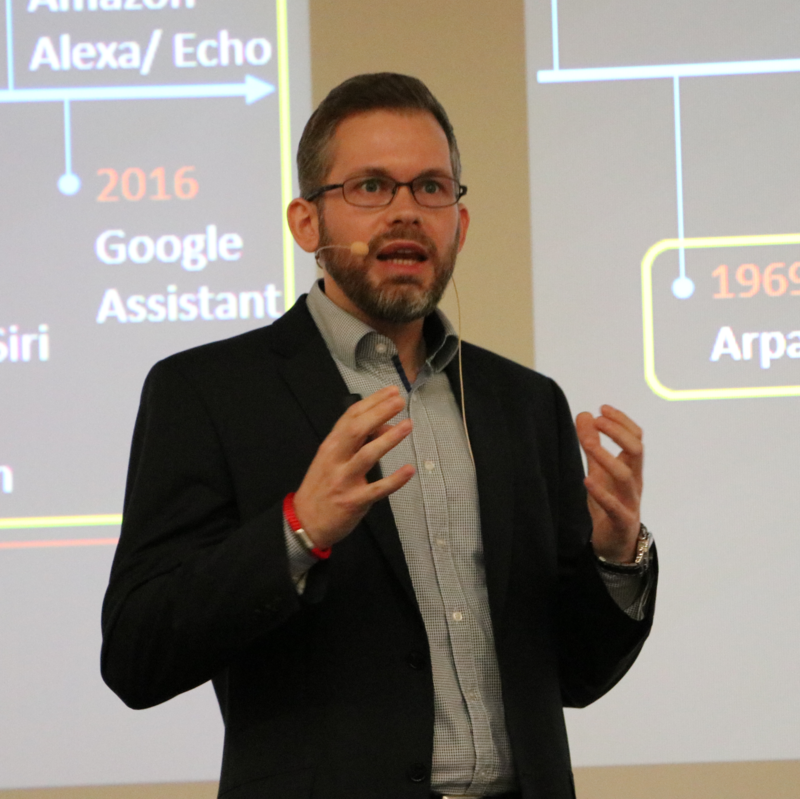 In the next decades, AI will become the game changer! It will accelerate innovation and lead to new business models. Today, AI applications already have the necessary maturity to increase the efficiency of single processes. However, one should not only see AI from an operational perspective to increase efficiency but also from a strategic angle in order to leverage the technological capabilities for new applications and use cases. And thus, create real values for customers, partners as well as for the own employees. Digital technologies such as artificial intelligence, cloud computing or IoT are the foundation for innovation and new business models that will change common rules and thus lead to ongoing disruptions within and across industries. In doing so, enhancing the customer experience by addressing their needs is crucial and thus constantly raises the customer expectations. Amazon, Google, Netflix, Spotify, Uber or Airbnb are just some examples. The hype around artificial intelligence today wouldn’t exist without cloud computing. The Internet of Things wouldn’t work without cloud computing and edge computing. The cloud wouldn’t work without virtualization and software-defined environments. Bottom line, If the majority of existing companies would have understood the power of the Internet in the 90s and the potential of cloud and mobile in the 2000s, the market would look quite different today. So, please don’t underestimate the impact of AI!